After weeks of leaks, Fujifilm has confirmed the X-T30, an update to the popular X-T20 mirrorless camera. The new model continues Fujifilm’s tradition of fusing much of the functionality of its higher-end single-digit X-T models – in this case the X-T3 – into a smaller, lighter and more affordable package. The X-T30 combines the same 26.1MP back-illuminated X-Trans CMOS 4 APS-C sensor and X-Processor 4 as the X-T3, in place of the X-T20’s 24.3MP X-Trans CMOS III sensor and X-Processor Pro engine. The partnership allows for a wealth of functionality not present on the X-T20, such as the Sports Finder mode that captures images at 30fps with 1.25x crop (and electronic shutter) and the recently-seen Monochrome adjust function, which allows for cool and warm tints to be applied to black-and-white Images. Video specs have also been bolstered, with 4K video recording now offered in both 4K UHD and 4K DCI flavors, rather than just 4K UHD. The model misses out on the X-T3’s 60p capture option when shooting in 4K, although it matches it in capturing oversampled 6K footage in each 4K mode before this is downsampled to 4K for output. This should mean the quality of what’s actually output is better than footage from the X-T20. Video can be captured internally to an SDHC or SDXC memory card in 8-bit with 4:2:2 chroma sub-sampling, and externally through the HDMI port at 10-bit with 4:2:2 sampling. The video-centric Eterna Film Simulation mode and zebra patterning are also now selectable in-camera, while the X-T3’s 4K Inter frame Noise Reduction feature has also filtered down. Fujifilm has also opted for a USB Type-C port rather than a 3.5mm jack, which allows for headphones with a USB-C connection to be plugged straight into the body. This port also allows for USB charging. Elsewhere, Fujifilm has retained the pop-up flash from the X-T20, and provided a hotshoe on the top plate for more powerful units. The X-T30 also debuts some new features which will eventually be made available to X-T3 users through a firmware update. These include a new Face Select option, which allows the user to shift priority between subjects when a number of faces are detected in the frame. Fujifilm also claims that Face and Eye Tracking are now less jittery than on the X-T20, each adhering the subject more surely, and that the camera will be able to stick with the subject better should something momentarily pass in front of it. Something else that’s changed it that the camera can now detect a face when it occupies just 7% of the vertical stretch of the frame, rather than the 10% required by the X-T20. The camera’s 2.36 million-dot electronic viewfinder has now been made brighter, up from 500cd/m2 on the X-T20 to 800cd/m2 here. Additionally, when set to the Boost mode, the feed refreshes at a rate of 100fps for better fluidity. The 3-inch tilting LCD touchscreen appears to be similar to the unit found on the X-T20, although it’s a touch slimmer by comparison, bringing it close to the main body. The most significant change in terms of operation is the adoption of the AF Focus Lever that has graced previous X-series models. This takes the place of the X-T2’s d-pad control, and is the main method of navigating the various menus, the other being through the camera’s touchscreen. Other features include 8fps burst shooting with the mechanical shutter, and 20fps with the electronic shutter at full resolution, together with wireless functionality and USB charging. 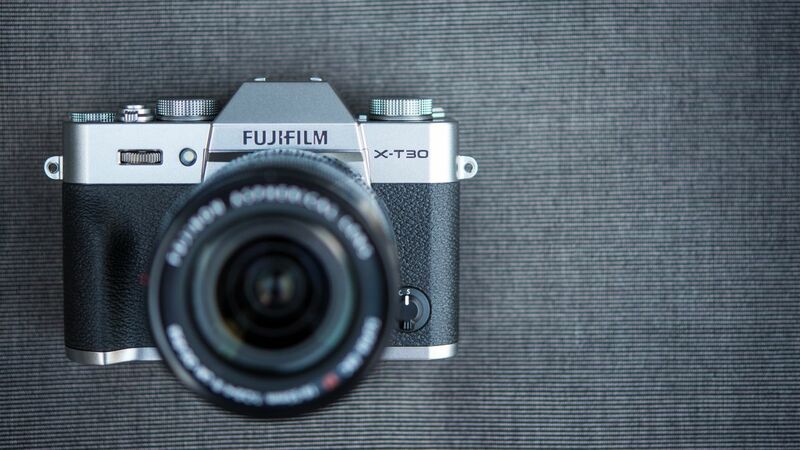 The X-T30 will be available in the same black and silver options as previous models in the range, and these are set to arrive on March 20 for the UK market, although the pair will be joined by a new charcoal silver finish in May. The X-T30 will retail £849 body-only in the UK and $899 in the US, while a kit with the Fujifilm XC 15-45mm f/3.5-5.6 OIS PZ lens is priced at £899/$999, and with the XF 18-55mm f/2.8-4 R LM OIS at £1,199/$1,299. Pricing for Australia is yet to be announced, but we’ll update this page once we have it.